Prana is nothing less than life itself. The steady of flow of prana is necessary to support our physical, mental and emotional health. In the course of life, blocks or obstacles may develop in our system, inhibiting the movement of prana. When that happens dis-ease and illness set in. As we approach the end of life prana becomes diminished until it can no longer support life. With the last breath, prana leaves the body. As critical as prana is to our health and our life, what can we do to support it? The eight limbs of yoga support prana, but the tool of yoga most connected with maintaining the flow of prana is pranayama, which means “extending life force energy” or prana. When we practice pranayama we use techniques to develop a smooth, steady breath. Because the breath and mind so intimately affect one another, the smooth steady breath calms the mind, and so the body. Pranayama has the potential to remove blocks and obstacles in our system, supporting our overall well-being. Sometimes an image comes to me that I feel compelled to share with my yoga class because it illustrates a teaching of yoga. Last week the image was a snow drop. They are small, modest, white flowers on delicate green stalks. But they can bring joy far outsized to their height and beauty as they are usually the first flowers to appear in late winter. 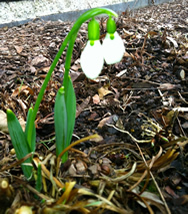 This year, with the snow covering much of the ground, snow drops have remained hidden. But what can a snow drop teach us about prana? In class we began by visualizing a snow drop as the breath deepened. We stood and began to move on inhale lifting the arms and heels, and lowering them on exhale. We paused, coming back to the image of the snow drop, visualizing the first tiny shoot emerging from the bulb beneath the earth, its life force energy pushing it upward. We moved into a posture we call “triangle twist,” connecting with the shoot’s flexibility to push around obstacles and our own spine’s need for flexibility. In honor of the life force of the snow drop and our own, we chanted a little Sanskrit chant acknowledging prana’s power and our reverence. In meditation we visualized the snow drop, its life force energy supporting its growth and blossoming. Each day now as the snow melts, I look in my garden just outside the backdoor for the snow drops. Waiting, I think of its life force – its prana – pushing it upward through the cold earth to emerge into the light and blossom. Grateful for the life force that supports the snow drop, that sustains me and all beings, I am nourished. You can hear the chant we used in class, honoring prana, by clicking the arrow below. Elizabeth, I have used this visualization and chant in my home practice, following your voice chant. Thanks for posting! It was most helpful. I am so sorry about the loss of your cat, Lillian. It is so difficult losing a pet. They are an important part of your family and you become so attached to them. Know that I understand and that my thoughts are with you, at this time. Bonnie. Thank you for your thoughts on the loss of Lillian, Bonnie. I know you have been through this before, as well. I am glad the snow drop visualization and prana chant is a nice adjunct to your home practice.